George Graham Reviews Marcus Eaton and the Lobby's "The Way the World Awoke"
In the wake of the Grammy Awards, and the accompanying notice of artists like Norah Jones and John Mayer, it's one of those occasional moments when one is tempted to say that there is perhaps some hope for the pop music world. This, of course, before one comes up against the reality of what continues to dominate the commercial media. Nevertheless, in the face of grungy corporate oxymoronically-named "alternative rock," manufactured teen pop stars, misogynistic rap, and automated, computer-driven dance music, an increasing number of artists are seeking to break out of the rut, and turn toward acoustic instrumentation, real musicianship and worthwhile, intelligent songs. Such have always been part of the folk and acoustic scenes, which remains an active niche, but signs of acoustic rock seem to be emerging, coming from a number of directions: folk, of course, and also the jazz-influenced sounds of artists like Jones, as well as some sunny neo-psychedelic acoustic pop that grew out of the alternative scene. This week, we have one of the best examples of intelligent acoustic rock in a long time. It's from an Idaho-based band called Marcus Eaton and the Lobby, and their debut national release is called The Day the World Awoke. Their sound dominated by acoustic guitar and saxophone, and woven into often funky rhythms, with absolutely first-class musicianship, musically sophisticated compositions, and upbeat, generally positive lyrics, delivered in an endearing tenor not unlike that of John Mayer. Marcus Eaton is the son of a songwriter and guitarist. Growing up in Pocatello, Idaho, he naturally gravitated to music. He said that because at his home, he could pick up only one TV channel, he turned toward creative activities, taking up the guitar at age nine. (There is definitely a lesson there.) In high school in 1996, he formed a duo called E.S.P. with drummer Nate Keezer, doing mostly original music. By then they had already developed a distinctive sound, and began to attract fans in their home town, often serving as an opening act for whatever national performers would come through town. Eaton then moved to the Idaho capital to attend Boise State University, while Keezer stayed home. But it wasn't long before Keezer also made the trip to Boise and joined Eaton, along with saxophonist Zak Franz and bassist Jim Monson to form The Lobby. From the start, the sound was spare, continuing the lean approach that Eaton and Keezer's acoustic-guitar-and-drum sound had started with. Initially the group turned out to be something of a jam band, mainly because of the need to fill time without a great deal of original material in hand. But Eaton continued to write, though without turning away from the group's inclination toward strong musicianship. All four players are outstanding. Eaton is especially impressive on guitar, playing with a percussive style that sometimes hints at the late Michael Hedges, and sometimes strumming like a folky, and at others getting quite jazzy. The presence of the Franz' saxophone will naturally conjure up an image of jazz for many, and that is not discouraged by the band, with their musically and rhythmically complex compositions. But one could also be reminded of the way the sax is used in the Dave Matthews Band. Bassist Monson and drummer Keezer are a tight unit that can negotiate the twists and turns of Eaton's music, running from funky to reggae to Latin, to interesting pieces in unusual time signatures, while always making it sound effortless. Eaton cites Paul Simon, James Taylor, Bob Marley and Dave Brubeck as principal influences, and you can hear the effect of all four fairly clearly on the band's music. Eaton and the Lobby have been touring extensively in the Mountain States and west to Washington State, and had put out some local releases. Now with The Day the World Awoke they are out with an instantly likable, intelligent, resourceful, and downright creative recording. While the music can often be lyrically philosophical, as Franz is quoted as saying, "There are issues of faith, [and] death, [but] by the end of the album, the only thing that remains is love." 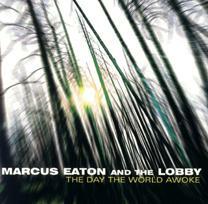 Idaho-based Marcus Eaton and the Lobby, on their new, national debut CD The Day the World Awoke has emerged fully formed as a very impressive band who combine acoustic instrumentation, creative compositions, and appealing vocals and world-class musicianship. This is one of those recordings that is hard to keep out of your CD player -- it's danceable, lyrically positive, with a great breezy instrumental sound, and lots of intriguing details beneath the sunny surface, that reveal themselves with each successive listen. Sonically, however, we'll give the CD no better than a B-minus for the all-too-typical malady of excessive audio compression. The heavy-handed attempt to make the CD loud all the time causes noticeable distortion on the bass and kick drum, which in turn affects other instruments. There is no excuse for mixing and/or mastering an acoustic band this way. While it's unlikely that acoustic rock of this high quality will ever displace the typical commercial media fare at the top of the charts, except in rare circumstances, it's nice to know that music this good can also rock, and may indeed find an audience.